Coinbase’s New Crypto Index Fund — Will It Be Successful? PAX Trading > ICOs > Coinbase’s New Crypto Index Fund — Will It Be Successful? On March 6th, Coinbase announced it will begin offering a new service called Coinbase Index Fund. This isn’t the world’s first passively-managed crypto index fund; however, it could soon become the most popular. Others like the Bitwise HOLD 10 Private Index Fund and the ICONOMI Digital Assets Management Platform have already had some early success. Now, Coinbase aims to surpass these funds and become ‘the Dow Jones of cryptocurrencies’. Let’s take a look at some of this project’s details and also look at what questions need to be answered before we can determine whether or not investors will support this new venture. Valued at $1.6 billion in August 2017, Coinbase is the world’s largest cryptocurrency company. Even with some intermittent availability issues and trouble with scaling the platform to meet user growth, Coinbase has quickly increased its user base and has become an industry giant in a short period of time. Although trading fell somewhat in January 2018 due to a bear market, Coinbase still averaged 227,417 trades per day. This is significant growthcompared to its average of only 15,857 trades per day back in December 2016. Coinbase generated over $1 billion in revenue in 2017, 66% higher than its goal of $600 million. Also, some financial analysts report that Coinbase had more active accounts and a higher annual revenue than Charles Schwab did in 2017. Why Offer an Index Fund? According to Coinbase Asset Management Product Lead Reuben Bramanathan, an index fund has always been a part of the company’s roadmap. The only difference is that Coinbase now believes there is enough user demand to offer this service. What sets this fund apart from most of the 225+ crypto funds available to date is that it will not be actively managed. Coinbase sees an opportunity in the market to create a passively-managed fund that allows investors to track and invest in cryptos across specific asset classes, instead of having to meticulously pick winners from losers on a case-by-case basis. Initially, this crypto index fund will only be accessible to accredited investors who are U.S. residents. However, Coinbase plans on expanding this service to other nations and increasing the number of investable digital assets. When a new asset gets listed on Coinbase’s exchange (GDAX), that asset will automatically be added to the fund. Will This Business Model Work? There are still many questions to be answered about the future of Coinbase Index Fund and crypto index funds as a whole. Here are three important details that will help determine the success or failure of this business model for Coinbase. While Coinbase has done a lot of work to make itself accessible for newer investors and retail investors (investors with lower budgets), the Coinbase Index Fund will require investors to invest a minimum of $10,000. Also, any investor who wishes to join must either have an annual income of at least $200,000 or a net worth of at least $1 million. While these requirements are lower than most traditional brokerage firms’ minimum investment requirements, this is still an extremely high barrier to entry for most investors. The main reason why Coinbase has this minimum requirement in place is that it has been historically difficult for crypto index funds targeted towards retail investors to get the approval of the U.S. Securities and Exchange Commission (SEC). One example is the SEC’s 2017 decision to reject the Winklevoss Bitcoin ETF (COIN) application to market its fund towards retail investors. While this decision had little effect on the crypto market as a whole, it has marked a huge setback for other companies like Coinbase that strive to be accessible for all level of investors. 2. Does This Fund Provide Value? 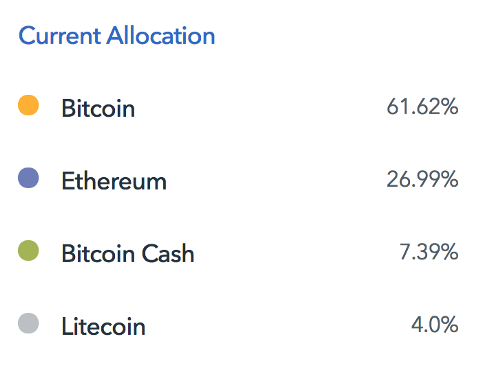 Another potential obstacle is that the initial value that Coinbase Index Fund offers is very low, mostly due to the limited number of available assets. BTC, BCH, ETH, and LTC are the only four cryptos initially being offered. It is realistic for an average investor to easily replicate this fund’s model at little to no cost. If Coinbase is able to increase the number of cryptos on the asset list and offer a variety of package options, it can potentially offer a service that adds a lot of value to investors and something that would be pretty difficult for most investors to replicate on their own. Coinbase is aware that more competitors are emerging to challenge its dominance in the market share. Currently, Coinbase has some of the highest exchange fees on the market. Its new index fund is no different, with a 2% annual management fee. As crypto exchanges like Robinhood and index funds like Crypto20 emerge, these competitors might offer better options for investors due to their lower fees. In the end, the return on investment will be the biggest determining factor for the success of Coinbase Index Fund. If Coinbase is able to help investors a significantly higher return than its competitors in the index fund market, people will gladly pay higher fees. Still, a lot of this falls outside of Coinbase’s control and depends mostly on the crypto market’s ability to recover from its early 2018 woes. What Can Be Done to Make This Fund More Competitive? If Coinbase is able to market its index funds towards retail investors and offer lower trading fees, it could dominate this market. Still, tight regulations by the SEC make this very difficult to accomplish. Obviously, there is enough interest from investors to start the fund. It will be very interesting to see this index fund’s future development and which new assets will be added. While Coinbase has had massive success so far, it is still a bit too early to tell whether this fund will be a flop or if it will become another highly profitable part of the Coinbase business model moving forward.